At UN, Susan Rice is Asked About Obama Order for CIA in Libya: Were Council Resolutions & Members Skirted? UNITED NATIONS, March 30 -- While the Obama administration argues that the UN Security Council resolutions on Libya provide the “flexibility” to allow arming of the rebels, a new question emerged on Wednesday. After US officials told the press that Obama signed a finding two or three weeks ago authorizing Central Intelligence Agency activities in Libya, Inner City Press asked US Ambassador Susan Rice on camera if that complied with the UN resolution, and whether it was or should have been disclosed to other Security Council members. Inner City Press began to ask as a follow up whether the US thinks that arming the rebels is permitted by the resolution or requires a ruling or new resolution. But Rice moved on to a question about the visa status of Miguel d'Escoto Brockmann, click here for that Inner City Press story. 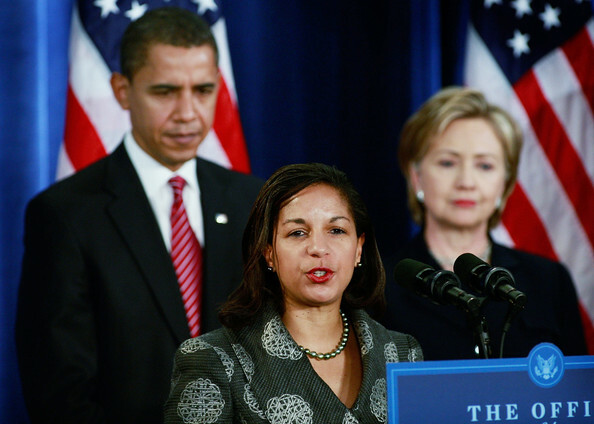 Moments later off camera Susan Rice summoned Inner City Press and said that “we have not made any decision” about arming the rebels. She said she had not seen the story quoting US officials about Obama signing the finding allowing CIA action in Libya. Russian Ambassador Vitaly Churkin told Inner City Press that the resolution do NOT permit arming the rebels, adding that the it “was the American who asked for the arms embargo.” How will he and other Security Council members react to the US officials' quotes about Obama authorizing CIA action in Libya, right while Security Council resolutions were being negotiated? Watch this site. Inner City Press: There are reports that President Obama signed a finding allowing the CIA to assist the Libyan rebels. Does this in any way implicate the two resolutions, including the arms embargo in 1970 that was modified by 1973? Is this something that you disclosed to other Council Members? Does it raise issues under the various prohibitions of the resolutions? Ambassador Rice: Well, first of all, obviously, as is longstanding U.S. practice, I’m certainly not going to comment on any intelligence matters. I will reaffirm what President Obama said yesterday which is that we have not made any decision about whether the United States will provide arms to opposition elements in Libya. We have neither ruled it in, nor ruled it out. We are considering all forms of potential assistance to the opposition from humanitarian, which we are already providing, to political and other forms of support.